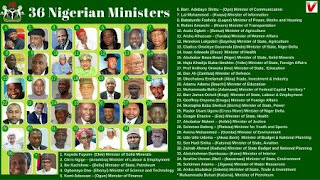 Home News Naija politics INAUGURATION: Nigeria's 36 Ministers and Their Portfolios. INAUGURATION: Nigeria's 36 Ministers and Their Portfolios. It's almost 6months when Buhari was sworn in as the president of Nigeria, Today the president has handed mantle of leadership to few privilege ones to join him in the train of change. Today the president designate duties to his ministers at his Villa in Abuja. Along side the hosting of the Nigeria U-17 who won the previous world cup.